Have you looked closely at your skin and noticed stretch marks in areas that aren’t as easy to conceal, or in areas that make you self-conscious? Do you wish you could wave a magic wand to make those pesky marks disappear immediately and indefinitely? Stretch marks are perfectly natural, and are caused by stretching of the connective tissue in your skin, which means everyone has some form of stretch marks. They can appear when you least expect them, or as a result of weight gain or loss, pregnancy, or just life in general. But, is there a cure for stretch marks, or at least a way to make their appearance less obvious? While a cure that will make these marks completely disappear has yet to be discovered, there are a few things you can do to smooth your skin out, allowing you to feel more confident in your skin. Here are a few things that could help you out. Before coming up with the best solution for you and your skin, it’s important to understand where stretch marks come from. Stretch marks appear when your skin shrinks or stretches rapidly. When your skin goes through these changes, the collagen in your skin can rupture, leaving a scar in its place as the skin attempts to heal itself. Stretch marks can be caused by a variety of reasons, such as growth and change during pregnancy and puberty, quick weight loss or weight gain, weight training, bodybuilding, and more. Stretch marks can appear in a number of areas on the body, depending on where the weight loss or gains are happening, and can be white, silver, or even dark purple in color. Again, there is no definite cure for stretch marks, especially because everyone’s skin is different, but there are a few things you can try with your dermatologist’s recommendation that can reduce their appearance. Moisturizing all areas of your skin on a regular basis is a skin care essential, but it can also help reduce the appearance of stretch marks. Applying a lotion, or even a special lotion that targets stretch marks, after bathing can be easily absorbed into the skin, leaving your skin feeling soft. Those who are pregnant may find that moisturizing on a daily basis can relieve rapidly stretching skin and reduce the appearance of stretch marks. If you are using a special stretch mark cream, lotion, or gel to relieve your stretch marks, be sure to do so early on, as the products may not be as effective on scars that have been around for many years. If you’re looking for a more natural remedy that you can try at home, start with something you may already have in your home: sugar. Glycolic acid (AHA) that is found in sugar is able to be absorbed into your skin to provide extra help to your healthy skin cells. Sugar can also help keep your skin soft and smooth, and can exfoliate dead skin cells along with improving blood circulation. There are quite a few sugar scrub recipes that you can try out using ingredients in your pantry, but make sure you test the mixtures out on a small area of your skin to make sure they won’t cause irritation. If you have any issues or notice a reaction, be sure to see your dermatologist. Stretch marks are typically only a cosmetic concern. 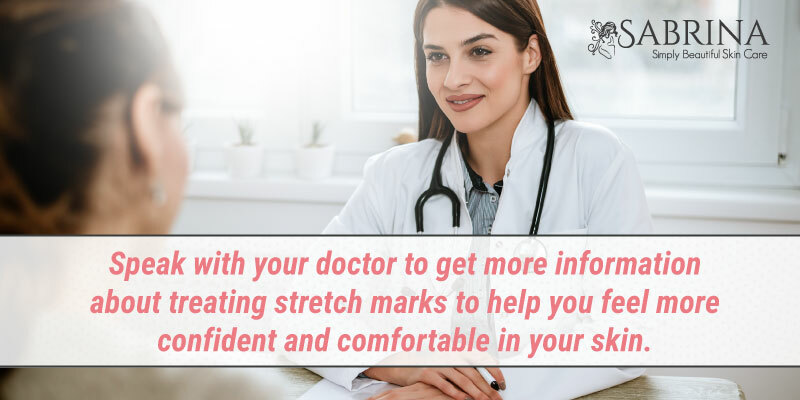 Speaking with your doctor to get more information about treating them may help you feel more confident and comfortable in your skin. Your dermatologist can recommend a scar or stretch mark treatment that can work, as well as some home treatments or other recommendations that can help you out. They will reiterate that there currently is no cure for stretch marks, but there are plenty of methods to try that can reduce their appearance. Stretch marks may be embarrassing and could make you lose some confidence. It’s important to remember that they are a perfectly natural part of being a human! Your body grows and changes from infancy to adulthood, during pregnancy, or even during a period of weight loss or gain, so don’t be alarmed when you notice them pop up during different stages of your life. Be proud of your skin and your body, and don’t be afraid to show it off! Aside from stretch marks, many are concerned about other marks on their skin – wrinkles and fine lines. These signs of aging can creep up when you least expect them, and can also leave you feeling less confident in your own skin. Fortunately, there’s a product that can help reduce these fine lines and leave your skin feeling smooth and healthy. The SABRINA Collagen Rx Plus Anti-Aging Face Cream was formulated to regenerate and heal your skin giving it a youthful, healthy feel and glow. For more information on this face cream and how it can help you with your aging woes, click here.